Narwhals may be wacky, but they're nipping at the heels of llamas and other "it" animals just in time for the holidays. NEW YORK (AP) — Technically speaking, narwhals are Monodon monoceros, or medium-size whales with long spiral tusks protruding from their heads. To fans, the crazy looking arctic creatures are more like unicorns of the sea. Narwhals may be wacky, but they’re nipping at the heels of llamas and other “it” animals just in time for the holidays. There’s an abundance of gifty narwhal items floating about, from apparel and plush toys to jewelry and home goods. There’s even narwhal wrapping paper, some with green wreaths dangling from the horn. Somebody’s interested, including conservationists looking to protect the endangered narwhal. According to Etsy, searches for “narwhals” have increased 16 percent so far this year over the same period last year. That’s more than 133,000 searches. Not life-changing, for sure, but fun enough. An Etsy seller with a shop called Fresh Dressed Tees offers a grumpy narwhal holding a sign that chides: “Not a Unicorn.” $20. On Amazon, a company called Foot Traffic touts seafoam green narwhal socks with a wavy splash of blue at the ankle. $9. Sky Tee Designs on Etsy offers a black hoodie that reads: “Always be yourself except if you can be a narwhal then always be a narwhal.” $35.66. Search for narwhal hats in a range of styles. There’s a website, narwhalclothingcompany.com , with a limited selection of narwhal caps, beanies, T-shirts, sweatshirts and other items. It donates 5 percent of its profits to Save the Whales. There exists a 16-month “Narwhal Nation” calendar that ends in December 2019. Each month offers inspiring words from the social media darling, such as “Find yourself and be that” and “I’m not weird. I’m limited edition.” On Amazon, from Rock Point. $10.39. Got a coloring person? Bazaar Encounters sells a coloring book with more than 30 narwhals. Worthy of kids and adults. It includes four pages of fun facts about narwhals. On Amazon for $7.99. Tons of other narwhal coloring books are there as well, along with actual books for reading about them. You were thinking about a journal anyway as a go-to stocking stuffer? Make it a narwhal cover. It’s a wide-ruled composition notebook adorned with frolicking narwhals and cute little rainbows. Comes with 55 sheets of paper. $4.99 on Amazon. Look around because there are others if this one doesn’t suit you. Claire’s, Walmart, Bed, Bath & Beyond, Neiman Marcus: You don’t need to break a sweat to find a narwhal in fun colors and styles. Among handcrafted items, an Etsy seller called SweetPeaStitches84 will customize and monogram one of the creatures with a little gold horn, starting at $25. For a child. 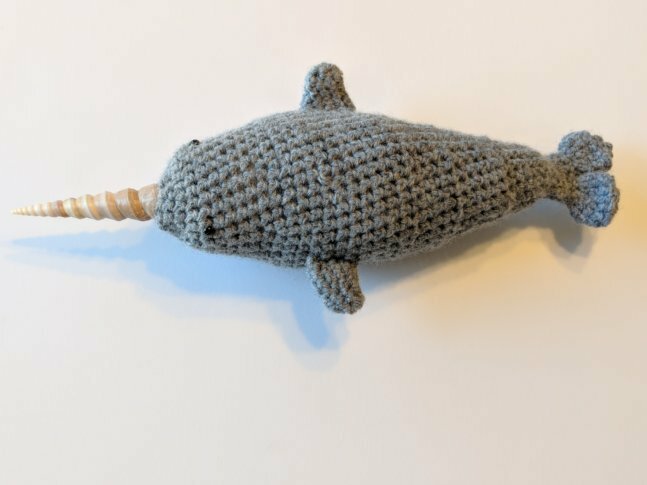 Another seller, ToCraftAHome, uses sea shells for the tusk in a handmade crochet narwhal. $22. Gund is in on the narwhal craze with a plump plush stuffed animal that measures 13 inches. $25. A company called Douglas does a rainbow narwhal with a silver tusk in different sizes. The medium sells for $17.95. Wall art, decorative pillows, duvet covers: There’s a narwhal out there to please everybody. Head to Wayfair.com for a nice selection. A truly beachy statement in a welcoming graphic art print comes on wood with two narwhals crossing horns and this message: “Not unlike the majestic narwhal, together we are just the right amount of wonderful & weird.” $80. Mugs, mugs and more mugs: Uncommongoods.com has one in blue ceramic and his name is Ned . $42. Over at Etsy, MoonlightMakers says it all with a blue narwhal playing the banjo on a mug that reads: “Stay Weird.” $15. For true believers, narwhals are living large in pendants, earrings and pins. Just search around. Etsy seller LichenAndLychee does a handmade necklace in recycled sterling silver of just the tusk, done in carved domesticated water buffalo bone. $95. Another seller there, DawningCollective, does a narwhal necklace in bronze that comes with a little tassel and a 30-inch chain. $55. Target even has on offer a narwhal Christmas tree ornament.